The National Kidney Foundation raised over $1 million at 30th annual gala with a special performance by Natalie Cole. 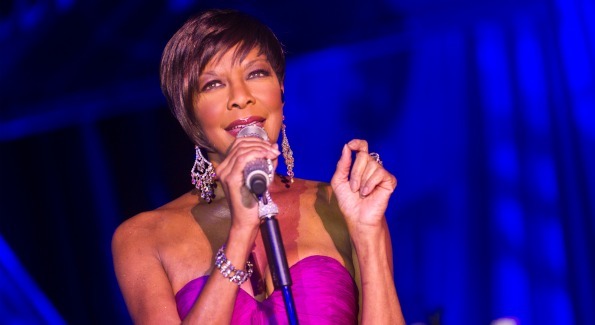 Grammy award-winning artist, Natalie Cole performs at this year's Kidney Ball. Image courtesy of Alfredo Flores. UNFORGETTABLE: Every November the Kidney Ball seemingly outdoes itself, and this year was no exception, filling the cavernous ballroom with scores of local tech execs for dinner and dance, and to cheer on aerial trapeze artists and a finale by Grammy-winning Natalie Cole, whose late father Nat King Cole joined her by video in a spellbinding duet. Led by chairs Debbie Ikirt and William Couper and attended by incoming D.C. Mayor Vince Gray, the National Kidney Foundation‘s 30th annual gala raised $1.1 million for kidney disease research. BELIEVERS: George Wilson, Chuck Prow, Ted and Carla Davies, Anne Altman, Xavier Alire, Bradley Schwartz, Tenley Carp, Carleton Jones and David Samuels.